Album title is printed on the front cover inlay as; 'Go Down...But Don't Bite It'. On the inlay spine it's printed as: 'Go Down (But Don't Bite It)'. 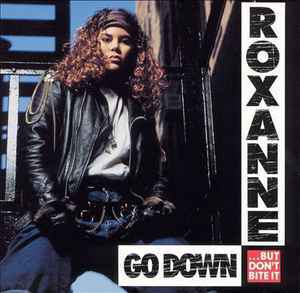 A reissue pressing of the CD originally released in 1992 (Roxanne* - Go Down (But Don't Bite It)). This reissued version also carries a different catalog number. Year / date of reissue isn't stated. Printed credit: Mastered at Hit Factory DMS. Track durations stated inside the front cover inlay. (P) & (C) 1992 Select Records.